The society is open for all doctors within specialties involved in trauma and emergency surgery (all surgical fields, anaesthesiology,radiology and emergency, military and disaster medicine) like; general surgeons,trauma surgeons, neurosurgeons, Intensivist doctor, orthopedic surgeon,vascular surgeon, thoracic surgeon, nose and throat surgeon, maxillofacial surgeon, emergency physician, radiologists, physiotherapist doctor and all internal medicine physician (Cardiology; Endocrinology and Metabolism;Gastroenterohepatology; General Internal Medicine; Geriatrics; Hematology,Oncology; Infectious Diseases; Nephrology; Pulmonary Disease; Rheumatology,Allergy and Immunology). As an integral part of the work and realization in any medical institution, family doctors, nursing personnel in each service unit, as mentioned above, as an essential part of the existence of any medical unit. The annual membership fee is 30 € (or 3000 leks) for specialists and 20 € (or 2000 leks) for doctors under training and for non-doctors. 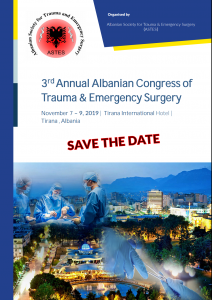 In addition to the above mentioned benefits, you become an active supporter of the promotion and development of Trauma and Emergency surgery in Albania. Don’t miss the chance to influence this development with your vote. Registration for endorsed courses and meetings at a reduced fee. The journal comprises 2 printed issues per year including regular information from the society.